BOOK LYNN O'DOWD NOW! - 312.498.1857 - UNLEASH YOUR INNER SUPERSTAR! 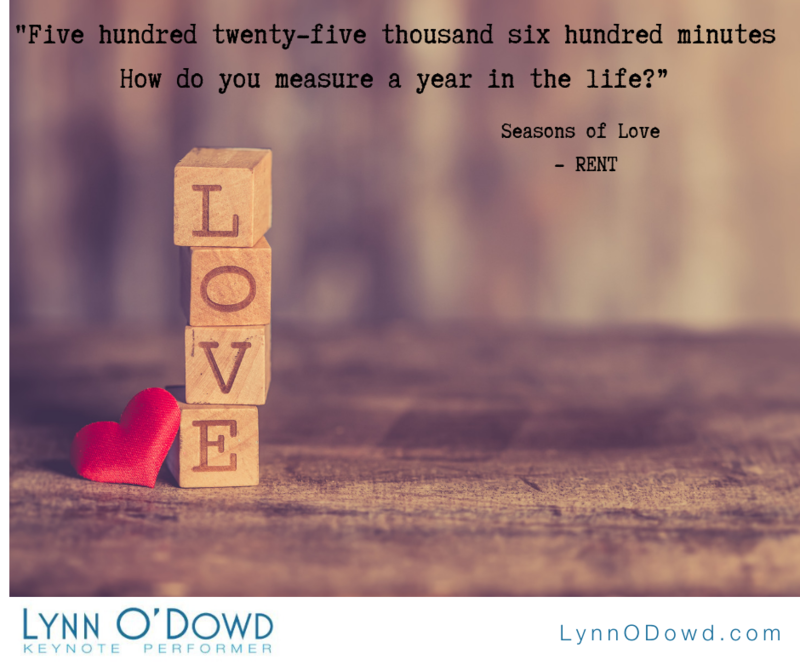 How do you measure a year in YOUR life? Are you happy with the way you’re spending your 525,600 minutes each year? It’s never too late to begin preventing that remorse, but a regret-free life does require action! Stop procrastinating. Start stepping out of your comfort zone, which is not always easy. If stepping out of your comfort zone were easy, you’d have done it already. Everyone would! And if you’re waiting for the right moment, when you’ll have the time to make that job change, read to your kids, exercise, start that business, write that book, start dating or spending more time with your spouse, significant other or friends …. Guess what? There is no perfect time, and the right moment is now. As the old saying goes: If not now, then when? Here’s the funny part – I was organized. I just kept re-organizing and shuffling things around, trying to reach perfection (which is impossible, by the way). Really, I was afraid to make the leap and get started. I didn’t know what to do, how to do it, or what, in fact, I truly wanted. Here’s what I learned in the process: I was never going to figure out how to start a professional organizing business in my head. I had to act, start doing SOMETHING and learn as I went. Your failures and your successes are teaching moments. You’ll figure out quickly what to keep doing and what to cut. How would you love to spend your 525,600 minutes in 2019? How do you want to measure your year? After not singing for 35 years – in a moment of madness – I answered an ad to be a singer in a Rock’n’Roll band… and got the gig. I share my story about how stepping out of my comfort zone and getting a little outrageous has changed my life. I want everyone I reach to experience the same transformation through the “GoGaGaTM” process I’ve developed to help attendees Unleash THEIR “Inner Superstar” and realize that it’s never too late to bust through their fears to perform at levels they never thought possible. My talk takes people from “I can’t” to “I can” in 45 to 60 minutes – with my special brand of entertainment with a message. Click here to download my speaker one-sheet, and book me for your next event. Powered by: Digital Edge Media Group | Not endorsed by or affiliated with Lady Gaga or her organization | ©2019 Lynn O'Dowd | All Rights Reserved.